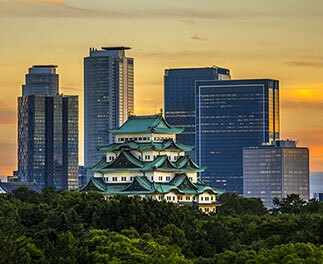 Tokyo, one of the world's largest cities, offers a uniquely eclectic mix of traditional and contemporary attractions. 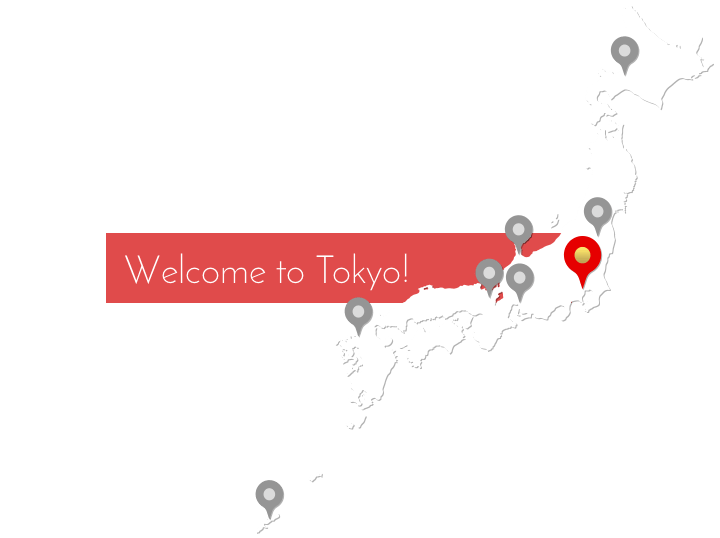 Please enjoy and discover Tokyo and beyond during your stay for a conference, meeting or business travel. There may be days in March when you need a heavy jacket, but the cold eases considerably in April and by May it can be warm enough for short sleeves during the day. 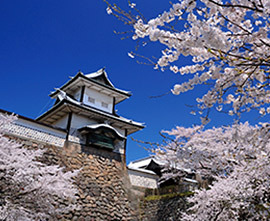 Peak cherry blossom season runs from late March through early April. The rainy season lasts from late June through around mid-July, with frequent rain and high humidity. After the rains, July and August usher in a steady stream of midsummer heat with temperatures over 30°C, including especially hot and humid days when the temperature rises above 35°C. The temperature can rise over 30°C even in September, but both temperature and humidity begin to fall gradually. 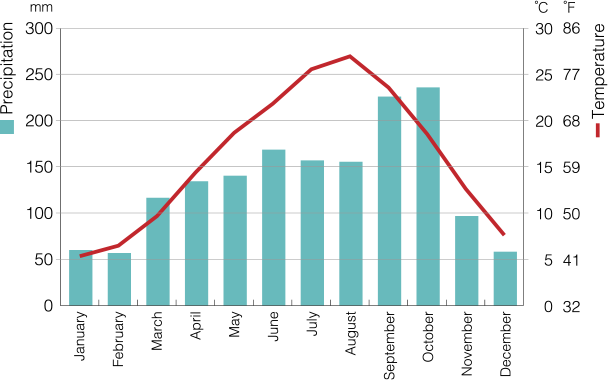 The peak season for viewing fall foliage starts in mid November. It is recommended to bring a heavy jacket when you come to Tokyo in November. Constant low temperatures make a jacket and coat indispensable, and it occasionally snows even in the city center. Japan uses yen (Japanese: 円, symbol: ¥, code: JPY). Coins come in 1, 5, 10, 50, 100, and 500-yen denominations while bills come in 1,000; 2,000; 5,000; and 10,000-yen denominations. As of June 2018, the exchange rate is 110 yen to the US dollar and 129 yen to the Euro. International credit cards such as American Express, Visa, Diners Club, and MasterCard can be used at most banks, hotels, inns, and stores. Although not accepted at as many locations as these cards, China UnionPay can also be used. However, some stores do not accept any credit cards, so it is a good idea to have some cash on hand. Roughly 27,600 Japan Post Bank ATMs located throughout Japan, as well as over 24,000 Seven Bank ATMs installed in 7-Eleven convenience stores, offer cash advances for credit cards issued overseas. 7-Eleven convenience stores are open 24/7. Logos displayed on or near the ATMs indicate which credit cards can be used. It is not necessary to tip for service in Japan, such as at restaurants, bars, taxis, airports and hotels. However, hotels and some restaurants indicate an additional service charge on their bills or menus, respectively. 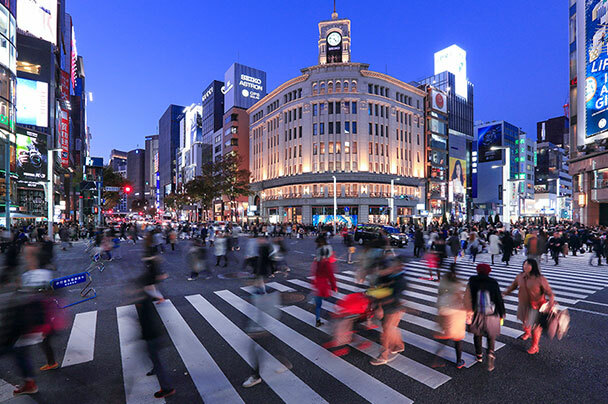 From cafés to train stations to airports, an increasing number of locations in Tokyo offer high-speed Internet connection via free Wi-Fi. Wi-Fi logos are displayed where services are available. Voltage in Japan is 100 V, while frequency varies by location: 50 Hz in eastern Japan including Tokyo and 60Hz in western Japan. 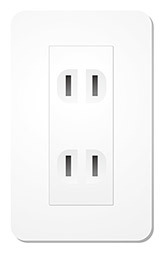 A 2-flat-pin type socket is used. Smoking is prohibited inside most buildings and stations, except for the designated smoking areas. Non-smoking signs show where you should not smoke, since some wards also prohibit smoking on the streets by local law or regulation. Japanese is the official language of Japan, English is widely spoken in Tokyo. Information desks at various facilities are often staffed with people who can speak English. 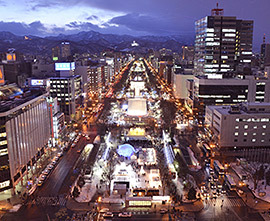 Japan has a visa waiver agreement with 68 countries and regions, under which delegates can enter the country for a short-term stay simply with their valid passport. *For details, please refer to the website of the Ministry of Foreign Affairs of Japan. A well-developed transportation network allows easy and convenient movement in and around the city, so you can come and go almost anywhere just by trains, subways or buses. A network of train lines operated by JR East Japan and the subway lines of Tokyo Metro and Toei link stations around Tokyo. Symbols and signage at the stations are multilingual in English, Korean and Chinese. Train timetables are located on the platforms and are very reliable since trains in Tokyo run on time. Smart cards "Suica" and "Pasmo" can be used on almost all rail and bus lines in the Tokyo metropolitan area, and are also accepted by a growing number of taxis. "Suica" IC cards are available for purchase at JR stations, while "Pasmo" cards are available at subway, private railway stations or bus depots. You can also use these cards for shopping as electronic money at an increasing number of registered shops. In addition to queuing for a taxi at a taxi stand, you can also flag down an unoccupied taxi on the street by raising your hand. The taxi's rear left-side door will open for you automatically, so there is no need to open it for yourself. Fares are paid at the conclusion of the ride, but some taxis cannot accept smart cards or credit cards, so be sure to check before you get in. 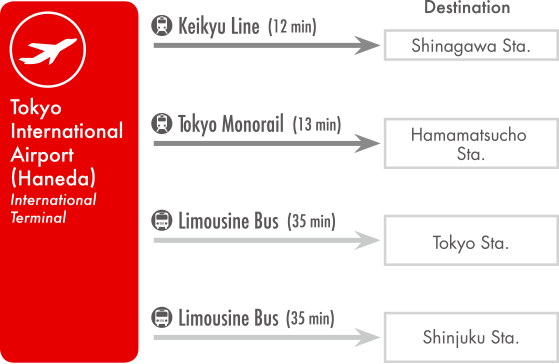 In the 23 wards of Tokyo, Musashino city and Mitaka city, the initial fare of 410 yen covers the first 1.052 kilometers, beyond which 80 yen is added for each additional 237 meters. 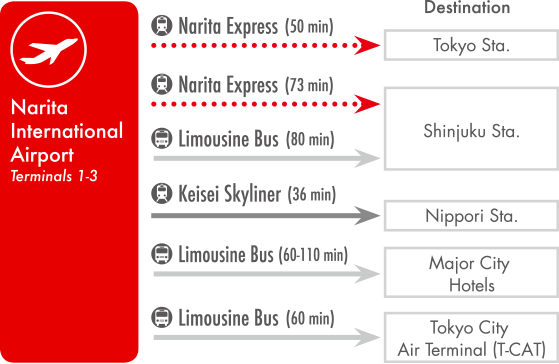 Many taxis have adopted a fare system based on time and distance that also adds a 80 yen surcharge for each 90 seconds traveling at less than 10 kilometers per hour. There are countless opportunities for you to shop for beautiful and innovative products including exquisite green teas, traditional sweets, attractive lacquerware, textiles, fashion and state-of-the-art electronic products Japan is famous for. Washoku, or authentic Japanese cuisine, including globally popular sushi and tempura, has been designated by UNESCO as an Intangible Cultural Heritage. 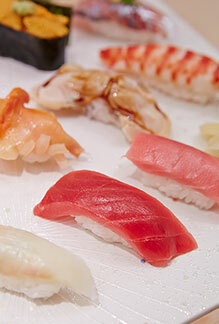 There are more than 160,000 restaurants in Tokyo and the most Michelin stars in the world. The exquisite quality and variety of dishes, from washoku to world cuisine, make for an unforgettable experience. You can even try an Izakaya (local pub) for Japanese beer and yakitori (grilled chicken on a skewer) just as the locals do. 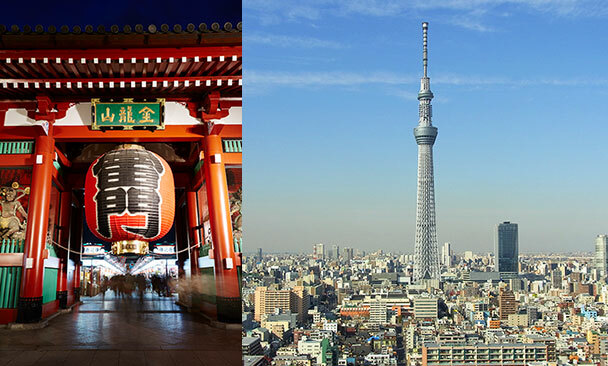 This location is home to one of the most popular tourist spots in Tokyo, Tokyo Skytree Town®, which has the world’s tallest free-standing broadcast tower. The area around the tower is complete with shopping and entertainment facilities. In contrast to the cutting-edge tourist attractions, atmospheric Sumida and Oshiage are crowded with people enjoying the sights of shitamachi areas, the traditional commercial and working class neighborhoods of Tokyo. 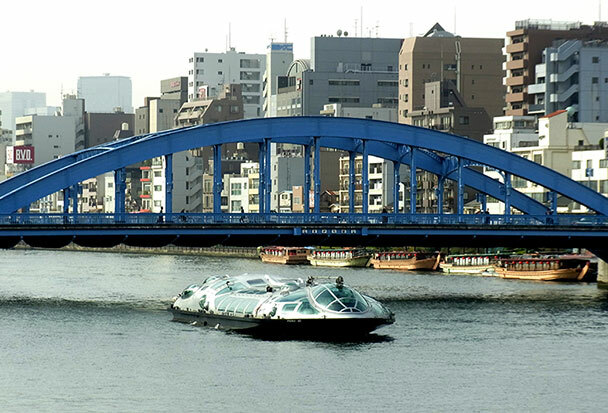 Just across the Sumida-gawa river is the district of Asakusa, where you will find the Kaminari-mon gate with its huge red lantern, and the Senso-ji temple, both landmarks from the old days. Have a pleasurable experience shopping at the shopping streets including Nakamise, visiting sightseeing spots in a rickshaw, or enjoying the cherry blossoms during spring and fireworks in the summer. 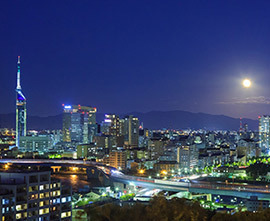 Tokyo offers a diversity of cruise types, from regular services convenient for sightseeing and traveling, to one-off services paired with seasonal events, to yakatabune services featuring meals and shows. 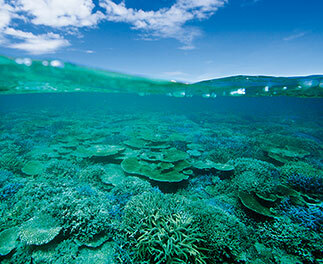 Select the ideal cruise to enjoy according to purpose or situation. 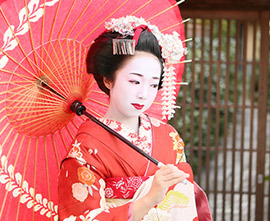 Kimono, the beautiful national costume of Japan also called wafuku (literally "Japanese-style clothing"), has won popularity beyond its birthplace. The garment is made with various materials, such as cotton and silk, and in different styles for different purposes, from formal to casual. Few people dress in kimono on a daily basis today, but the gown remains essential to traditional Japanese culture and is worn on special occasions like weddings and New Year celebrations. Yukata is a variant of the kimono made with a lighter fabric. The stylish gown comes in diverse colors, patterns, and materials. And compared to the kimono, it's easier to put on. Both kimono and yukata give the wearer a taste of Japan. Although it's possible to dress yourself, professional services are available, too. It's worth creating the opportunity to have a photograph taken or stroll the streets of Tokyo wearing a kimono or yukata. The traditional tea ceremony known as sado expresses the Zen philosophy of living in the moment. An elaborate ritual performed in a peaceful setting, sado offers an exercise in contemplation and conversation as much as an opportunity for refreshment. Exquisite utensils and bowls are employed to heighten the aesthetic experience, and sweets are served as accompaniments.